A unique queen's crown with ancient symbols combined with a new method of studying status in Egyptian reliefs forms the basis for a re-interpretation of historical developments in Egypt in the period following the death of Alexander the Great. A thesis from the University of Gothenburg (Sweden) shows that Cleopatra was not ancient Egypt's only female pharaoh – Queen Arsinoë II came first, 200 years earlier. 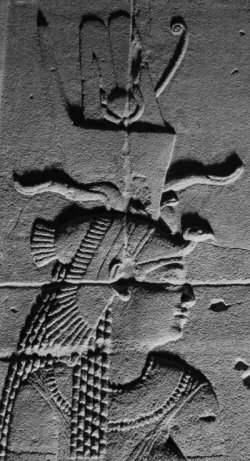 Researchers are largely agreed on Queen Arsinoë II's importance from the day that she was deified. She was put on a level with the ancient goddesses Isis and Hathor, and was still respected and honoured 200 years after her death when her better-known descendant Cleopatra wore the same crown. But the reasons behind Arsinoë's huge influence have been interpreted in many different ways. Maria Nilsson has studied her historical importance by interpreting her personal crown and its ancient symbols. The crown, which has never been found but is depicted on statues and Egyptian reliefs, was created with the help of the powerful Egyptian priesthood to symbolise the qualities of the queen. The thesis questions the traditional royal line which excludes female regents, and defies some researchers' attempts to minimise Arsinoë's importance while she was still alive. "My conclusion instead is that Arsinoë was a female pharaoh and high priestess who was equal to and ruled jointly with her brother and husband, and that she was deified during her actual lifetime," says Nilsson. "It was this combination of religion and politics that was behind her long-lived influence." But it was not only Cleopatra who wanted to re-use Arsinoë's important and symbolic crown. Male descendants – all named Ptolemy – used her crown as a template when creating a new crown which they gave to the goddess Hathor to honour the domestic priesthood and so win its support when Egypt was gripped by civil war. The thesis is clearly structured around the crown and includes its wider context in the reliefs. Nilsson paints an all-round picture of the queen, how she dressed, the gods she was depicted with, the titles she was given, and so on. The source material comes from Egypt and can be used as a basis for understanding the country's political and religious development. At the same time, Nilsson paves the way for future studies of Egyptian crowns as symbols of power and status, and of the development of art in a more general sense. "The creation of Queen Arsinoë's crown was just the beginning," she says.